Same or different personalization on each of the glasses - the choice is yours! Why have mason jars become so popular? They are used for so many different things. We think it is nostalgia - the mason jar remind us of the good ol'd days. What ever you reason for loving mason jars - we think that our 16oz mason jar mugs are hands down the most versatile glass for your home bar. You can serve just about any drink in this mug - from cocktails to beer to soft drinks to lemonade, ice tea and even water! Our mason jars are a roundish square with a smooth curved handle which gives them really nice rustic feel. They measure approximately 5.3" Tall and 4.1" wide and the mouth of the mug is 4" in diameter. The jars are nice and thick, so they do keep the drinks colder. 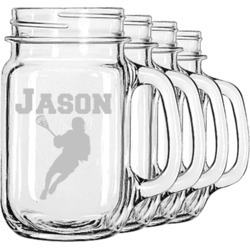 Our mason jars are sold in sets of 4 and are engraved for you with your design. 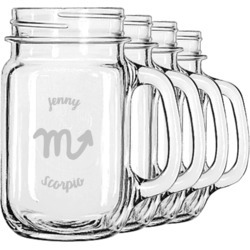 You can engrave all 4 mugs with the same design, or you can design each jar individually - the choice is yours. You can browse the designs we have already created for you and customize a design to suit your individual needs or you can design one in our customization system. We have a huge selection of designs, fonts and graphics for you to choose from. Please contact us if your are unable to find what you are looks for and we will do our best to accommodate your needs.